United Soccer Coaches has developed the Foundations of Coaching online course as the perfect introduction to coaching youth soccer for the first time, and as a helpful refresher for those coaches coming back to the youth game. Focusing on improving coaching instruction in order to progressively improve player development, the Foundations of Coaching provides insight into targeted training activities and age-appropriate instruction for beginning to advanced players. What are the prerequisites for the Grassroots Licensing Courses? 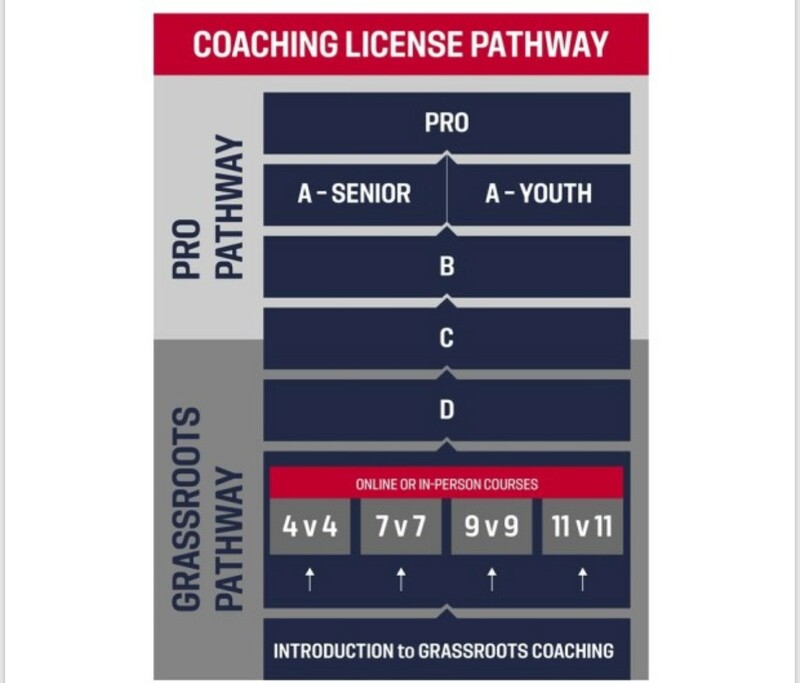 The Introduction to Grassroots Coaching Module serves as the first step in obtaining any one of the eight new Grassroots Licenses: four in-person courses and four online courses across the four grassroots levels: 4v4, 7v7, 9v9, 11v11. The eight course options relate directly to small-sided games and the respective age-groups outlined in the U.S. Soccer Player Development Initiatives. After completing the Introduction to Grassroots Coaching Module, candidates can progress to any of the eight grassroots license course opportunities through the U.S. Soccer Digital Coaching Center. This unlocked approach to the foundation of the pathway allows coaches to seek out education related to the environment that they are coaching in. What are the prerequisites for each course level? A - Senior Course: Applicants must be at least 18 years of age, have held the B License for a minimum of 6 months, must have 4 years of coaching experience (at any level), and must have access to a team of senior players in a high-performance environment to complete their assignments. A - Youth Course: Applicants must be at least 18 years of age, have held the B License for a minimum of 6 months, must have 4 years of coaching experience (at any level), and must have access to a team of elite youth players in a high-performance environment to complete their assignments. B - Course: Applicants must be at least 18 years of age, have held the “C” License for a minimum of 12 months, must have 3 years of coaching experience (at any level), and must have access to a team playing the 11v11 game to complete their assignments. C - Course: Candidates must be at least 18 years of age and have held the “D” License for a minimum of 12 months.